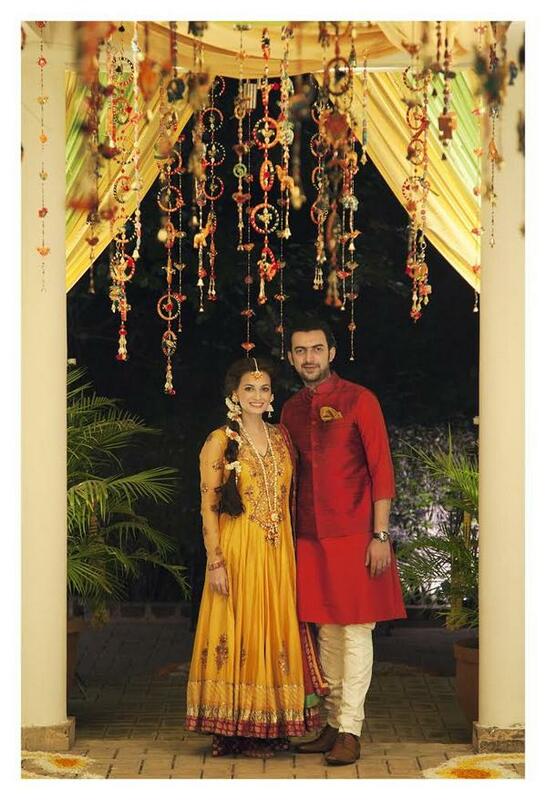 All of you by now know we gals at blingsparkle are obsessed with everything bridal and keep a close watch on all celebs tying a knot just to see what they end up wearing and it was no different when Dis tied the knot this week..
For the Mehendi ceremony Dia mirza chose a mustard yellow almost floor length anarkali paired with shararas (look closely for a peek at them;) ). Like the trend these days Dia also went for matching floral jewellery. I was a little surprised with sleeves coz id never recommend wearing full sleeves for Mehendi but considering how little mehendi Dia got done on her hands the sleeves were ok. But tell me why would you have a elaborate mehendi ceremony and not get some excessive mehendi applied? Little disappointed there. Wedding is the only time where you can go over the top with everything and still be forgiven , id grab that opputunity, but thats just my thoughts. I do love the decor, looks fun. 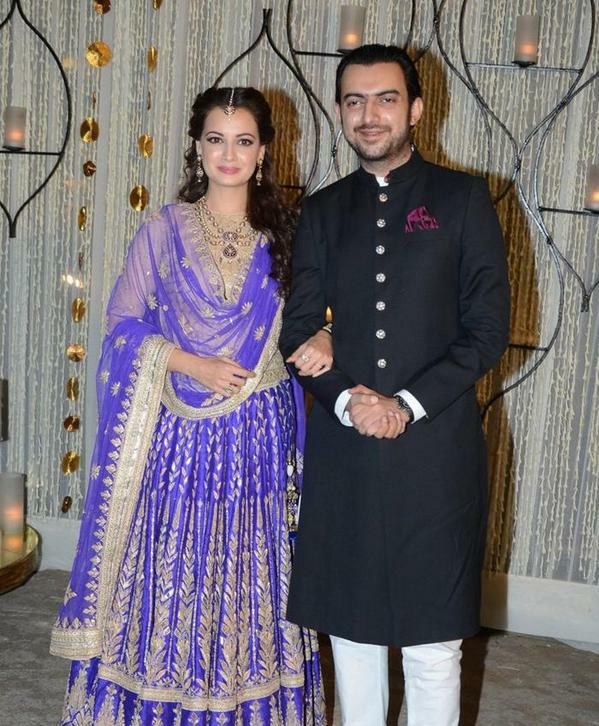 For sangeet Dia mirza wore a gorgeous Anita Dongre Lehenga with a high neck blouse and polki jewellery. The make up was Perfect. Love. Steering away from traditional wedding colours of red/pink/orange dia chose a sharara in green and biege by ritu kumar . 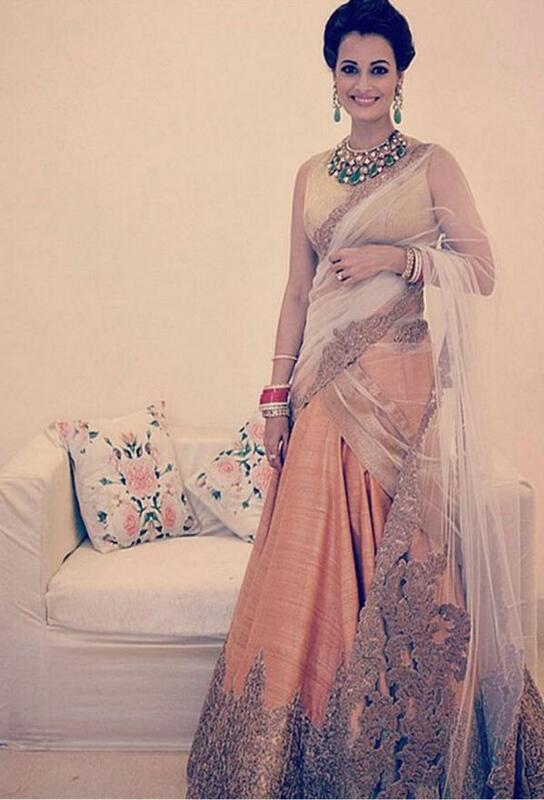 In this traditional outifit Dia looked with royal and i love her jewellery, especially her jhoomar. Hats off to her for wearing green on her D day! 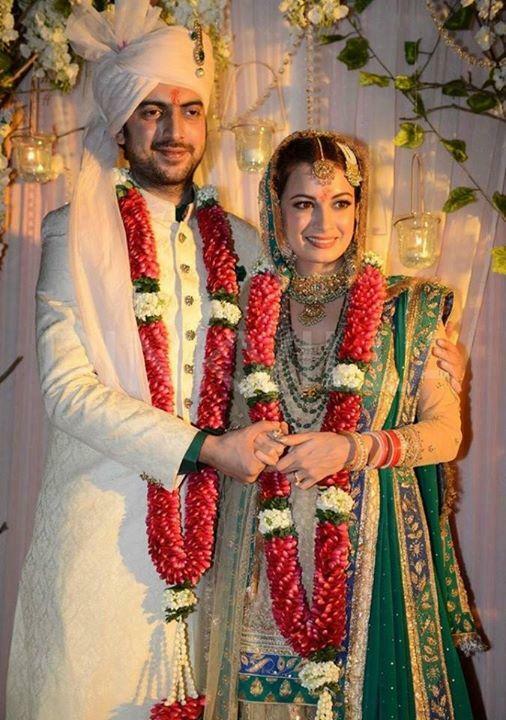 It was a peach lehenga by shantanu and nikhil for the wedding reception paired with emerald jewels. Love her hair. Which outfit did you like the most? 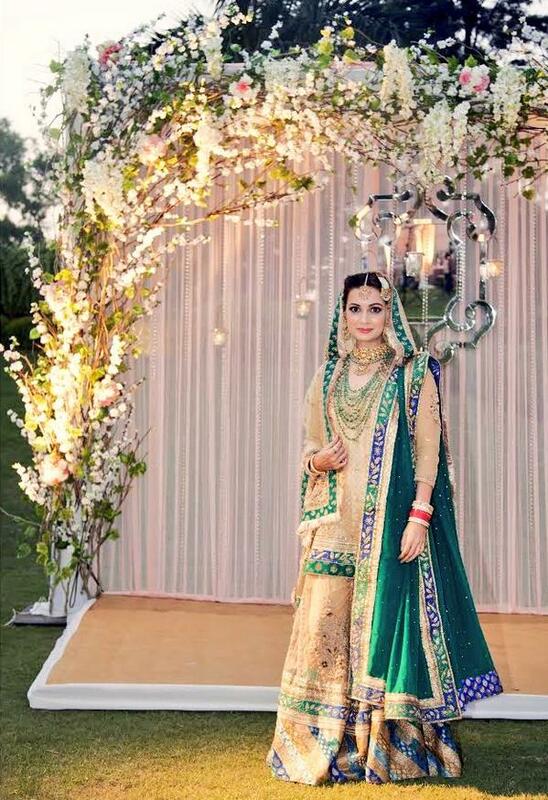 I personally loved her wedding green look but wish it had more green and less beige .